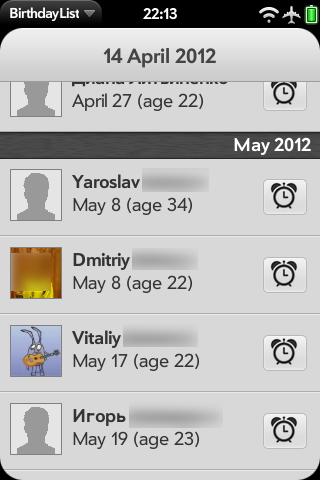 The application shows all your on-device contact's birthdays (from all accounts) and allows to add reminders to them. Screenshots talk for themselves - check them out. To see my other apps, visit http://ryhor.com, you can also contact me via twitter @rburakou. *Enyo framework must be installed via HP Maps update, webOS 2.2.x update or manually, using Preware.